The Paramecium is the most studied of the one celled Protozoa because of its complex makeup. 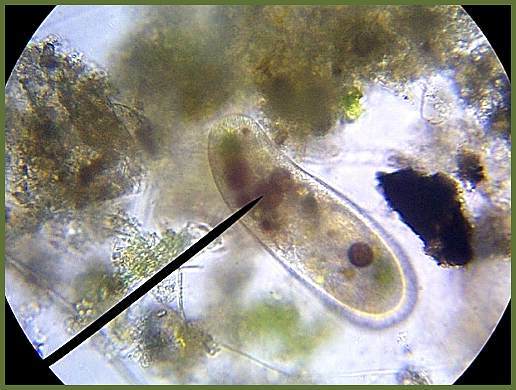 It's a ciliate, so you can see the cilia surrounding the body, although blurred. The cilia propel it through the water and it moves quickly, rarely stopping for a breath. This was a fortunate photo - it slowed just enough for me to capture this "less than perfect, but better than most" image of a Paramecium on the move.